China's economy ended 2018 on firm footing amid a complex external environment, with better quality and improved structure. Gross domestic product totaled 90.03 trillion yuan ($13.28 trillion) in 2018, more than half of which was from the service sector. Consumption remained the major economic growth driver, contributing 76.2 percent to GDP growth last year. Retail sales, a main gauge of consumption, rose 9 percent from a year earlier. China's economy performed within a reasonable range in 2018, with economic growth being generally stable and improvement achieved in performance, Ning Jizhe, head of the National Bureau of Statistics (NBS), said at a press conference. Contributing to nearly 30 percent of the world's economic growth, the country's economy remained the largest contributor to global economic growth, Ning said. China's economy advanced 6.6 percent year-on-year in 2018, in line with the official target of about 6.5 percent, data from the NBS showed. Growth in the fourth quarter came in at 6.4 percent, down from 6.5 percent seen in the third quarter, according to the NBS. China's consumer price index, a main gauge of inflation, rose 2.1 percent year-on-year in 2018, staying within the range of mild growth, said the NBS in its report. The reading was lower than the yearly control target of 3 percent. In December, the figure stood at 1.9 percent year-on-year, remaining flat the previous month, according to the bureau. 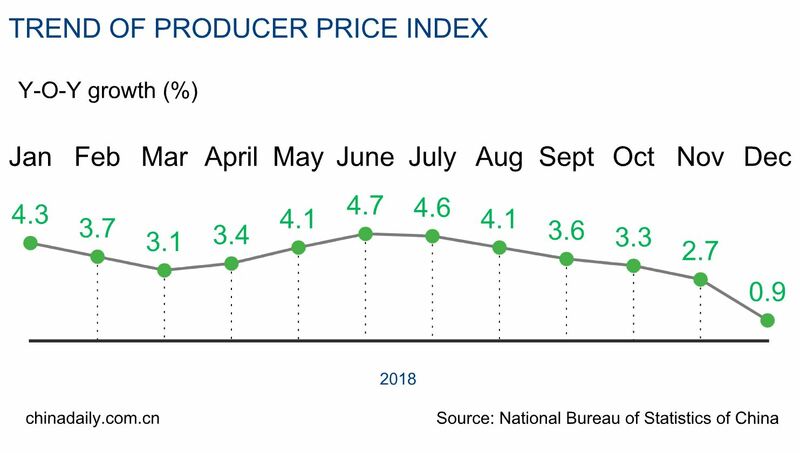 For all of 2018, producer price index, which measures costs for goods at the factory gate, climbed 3.5 percent from one year earlier. In December alone, producer price inflation rose 0.9 percent year-on-year, retreating from November's 2.7 percent, the NBS data showed; on a monthly basis, the figure dropped 1 percent. The purchasing managers' index, an indicator of manufacturing sector health, stood at 50.9 percent on average for 2018, compared with 51.6 percent the previous year. And the figure in December came in at 49.4 percent, decelerating 0.6 percentage points in November and falling below the boom-bust line of 50 percent, according to the NBS. A reading above 50 percent indicates expansion, while a reading below reflects contraction. China's fiscal revenue rose 6.2 percent year-on-year to 18.34 trillion yuan in 2018, according to the Ministry of Finance. The central government collected more than 8.54 trillion yuan in fiscal revenue, up 5.3 percent year-on-year, while local governments saw fiscal revenue expand 7 percent to top 9.79 trillion yuan. China's industrial output gained 6.2 percent last year, with slow yet stable growth, official data showed. The figure for December was 5.7 percent, accelerating 0.3 percentage points from the number recorded in November. 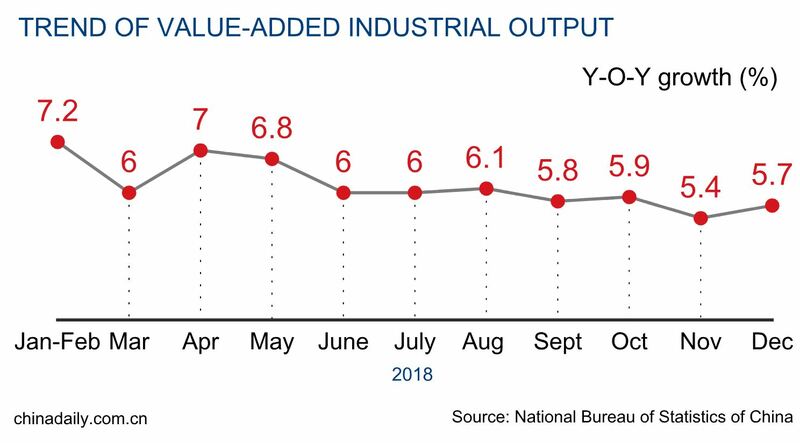 Industrial output, officially called industrial value added, is used to measure the activity of designated large enterprises with annual turnover of at least 20 million yuan. 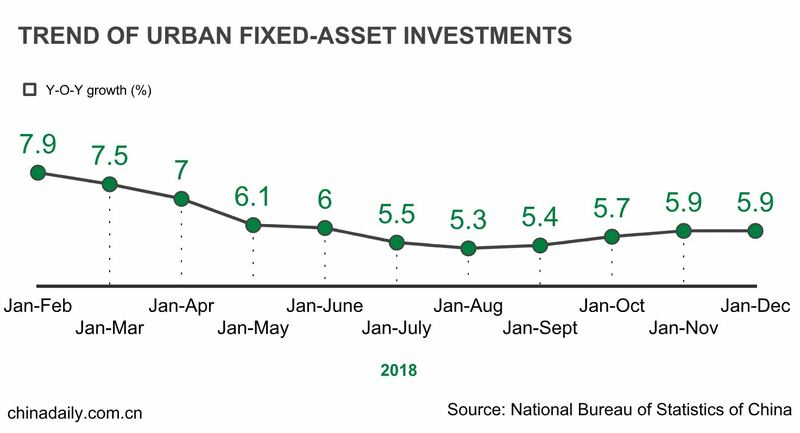 Fixed-asset investment grew 5.9 percent over the course of 2018, remaining flat with that of the first 11 months and down from a rise of 7.2 percent in 2017. 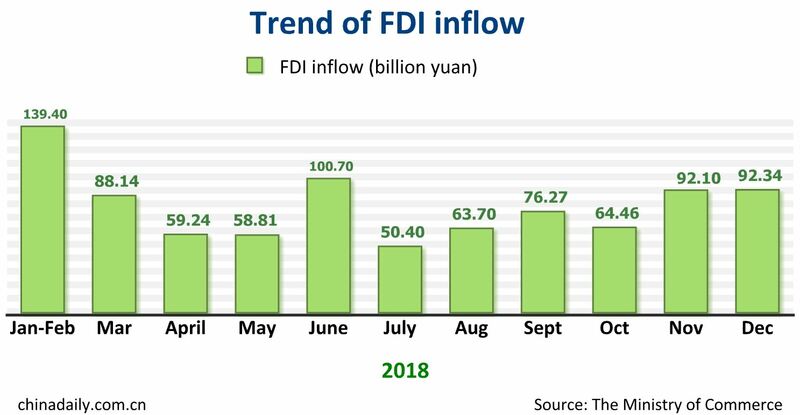 Month-on-month, December saw a 0.42 percent increase in FAI, while private investment expanded 8.7 percent compared with previous year. 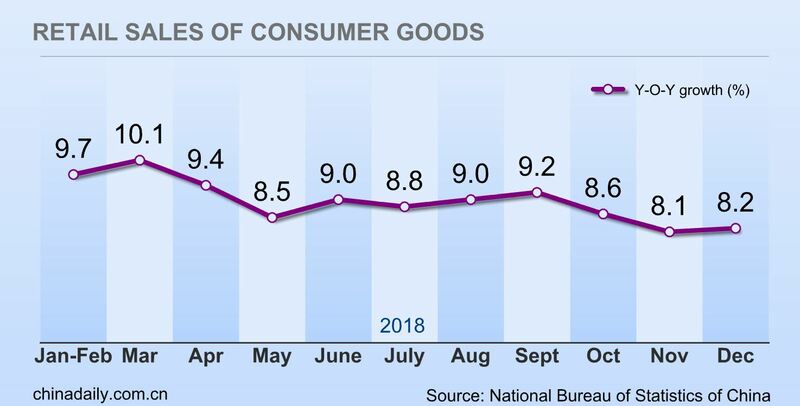 China's retail sales of consumer goods rose 9 percent to more than 38 trillion yuan in 2018, with the number in December increasing 8.2 percent year-on-year to 3.59 trillion yuan, according to the NBS. Notably, online retail sales in 2018 reached over 9 trillion yuan, an increase of 23.9 percent compared with that of last year. China's foreign trade volume rose 9.7 percent year-on-year to surpass 30 trillion yuan, a record high, said the NBS. 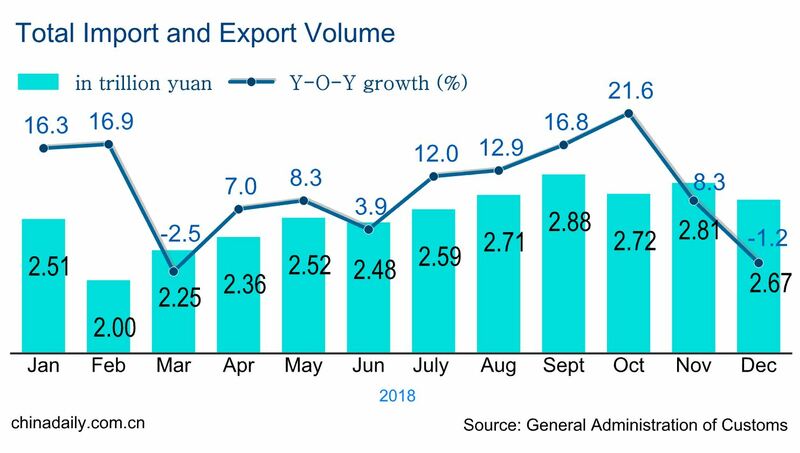 Among the figures, exports climbed by 7.1 percent to total 16.42 trillion yuan, while imports surged 12.9 percent to 14.09 trillion yuan. Thus, the trade surplus was 2.33 trillion yuan, shrinking 18.3 percent from the previous year. Total imports and exports achieved the set goal of stable and positive development with increased volume and optimized structure. Foreign direct investment rose 0.9 percent in 2018 to reach 885.61 billion yuan in 2018, the Ministry of Commerce said. According to the MOC, 60,533 foreign-funded companies were set up in China during the whole year, up 69.8 percent from a year before. The statistics from MOC and State Administration of Foreign Exchange showed outbound direct investment across industries reached $129.83 billion, an increase of 4.2 percent on a yearly basis. 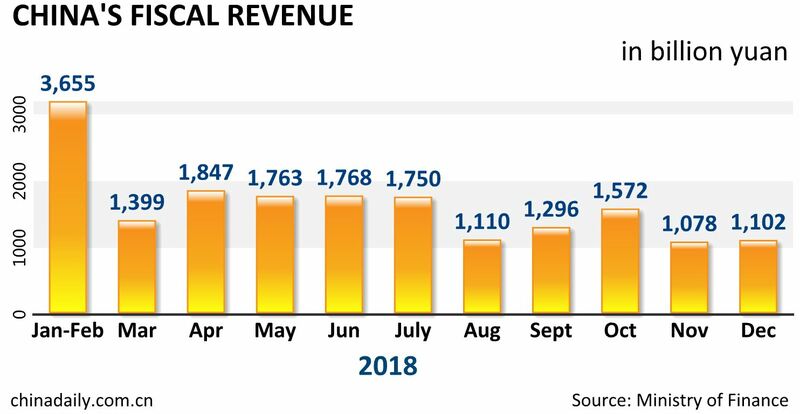 Breaking it down, financial outbound direct investment lifted 105.1 percent year-on-year to $9.33 billion, while non-financial ODI rose by 0.3 percent, with amount of $120.5 billion. In 2018, new yuan-denominated lending totaled 16.17 trillion yuan, 2.64 trillion yuan more than the previous year, according to the People's Bank of China. The M2, a broad measure of money supply that covers cash in circulation and all deposits, reached 182.67 trillion yuan at the end of December, up 8.1 percent from a year earlier, the central bank said, adding the growth rate was the same as the same period last year. The narrower measure of money supply, or M1, which covers cash in circulation plus demand deposits, rose 1.5 percent year-on-year to 55.17 trillion yuan at the end of December. M0, the amount of cash in circulation, was up 3.6 percent year-on-year to 7.32 trillion yuan. 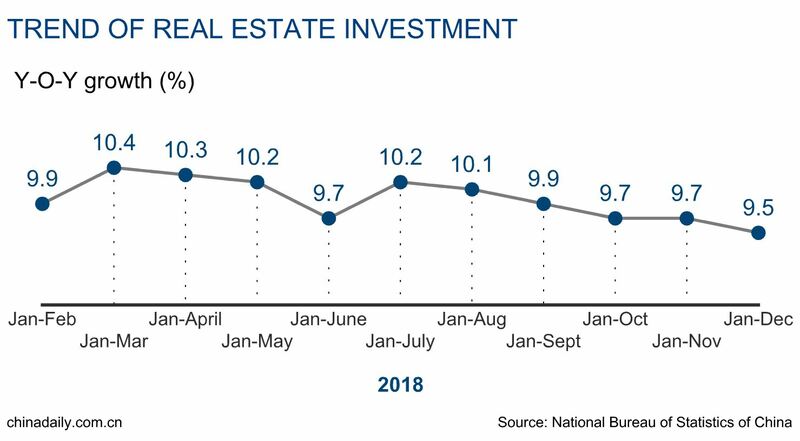 China's real estate investment went up 9.5 percent year-on-year to exceed 12 trillion yuan, said NBS. Its newly released data showed that growth figure was lower by 0.2 percentage point from that in the first 11 months, while lifting 2.5 percentage points from a year earlier. 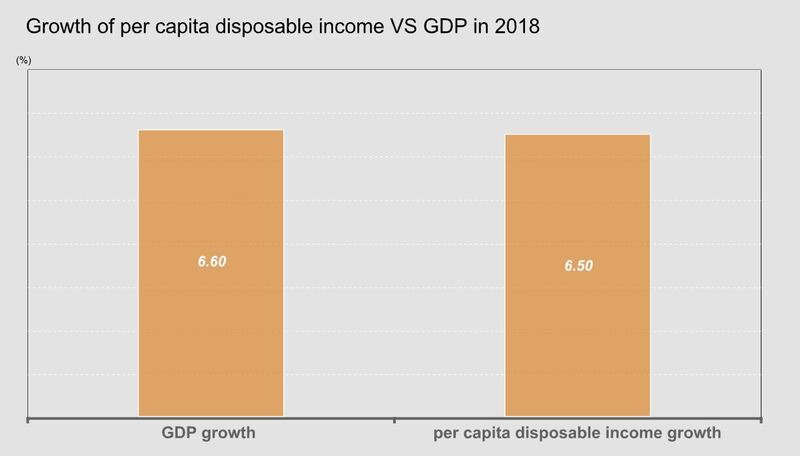 China's per capita disposable income stood at 28,228 yuan in 2018, up 6.5 percent year-on-year in real terms, NBS figures showed, compared with the GDP growth of 6.6 percent in the year. Separately, urban and rural per capita disposable income reached 39,251 yuan and 14,617 yuan, respectively, in 2018, up 5.6 percent and 6.6 percent in real terms after deducting price factors. A total of 434.19 million people worked in urban areas at the end of 2018, the number was 9.57 million more than that until 2017. From January to December, China's surveyed unemployment rate in urban areas stayed in the range between 4.8 to 5.1 percent, with most of the 12 months having lower rate than in the same period previous year. 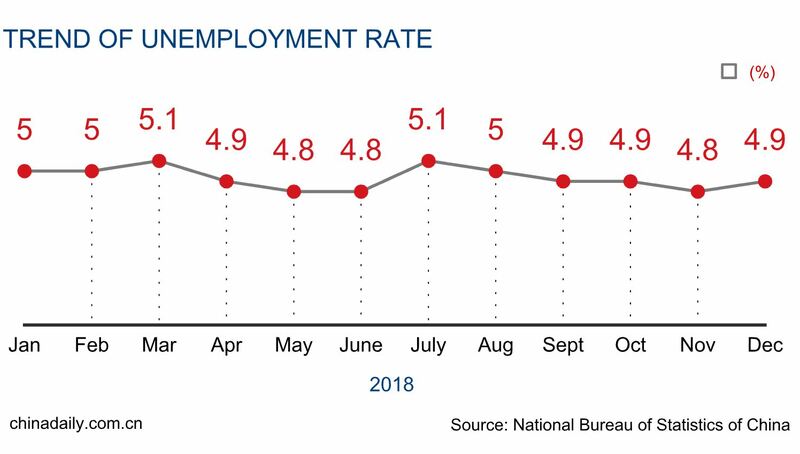 In December, the surveyed unemployment rate in urban areas stood at 4.9 percent, slightly up by 0.1 percentage point from November and maintaining below 5 percent in the straight fourth month. 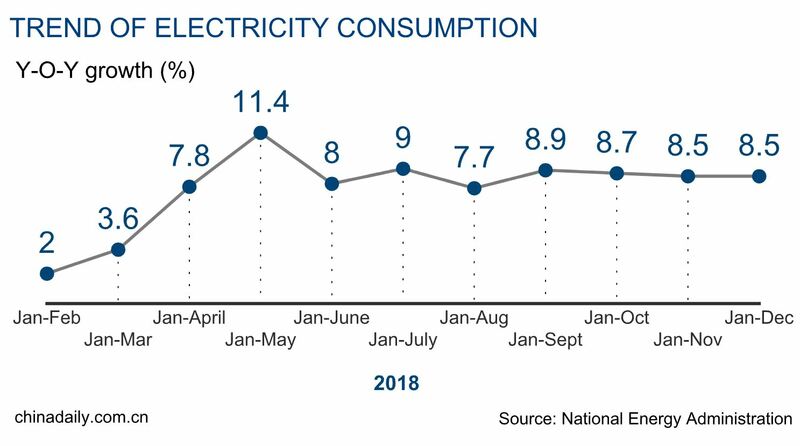 China's power consumption saw a faster growth in 2018, according to the National Energy Administration. Electricity use increased 8.5 percent year-on-year to 6.84 trillion kilowatt hours over the year, 1.9 percentage points higher than a year before and reaching peak consumption since 2012.